– Infected people can shed large amounts of norovirus in their vomit and diarrhea. – Norovirus can persist on common kitchen surfaces for up to 6 weeks. – Most hand sanitizers are not effective at reducing norovirus from hands. – Don’t wash raw meats. Salmonella and other bugs can be sprayed up to 3 feet away by washing. – Fresh produce is not cooked, so any poop that comes in contact with it from farm-to-fork can be passed to diners. – Don’t just employ temporary measures to eliminate the pests; spend time to correct the reasons behind the infestation. – Holidays are often time of year when large quantities of food will be bought in bulk resulting in additional places for pests to hide. – An estimated 7,700 diners may have been exposed to Hepatitis A in Texas. – Servers while not traditionally thought as food handlers are often involved with scooping beverage ice and salad prep. – Handwashing can reduce the chance of passing on Hepatitis A to patrons. Keep poop off your hands. 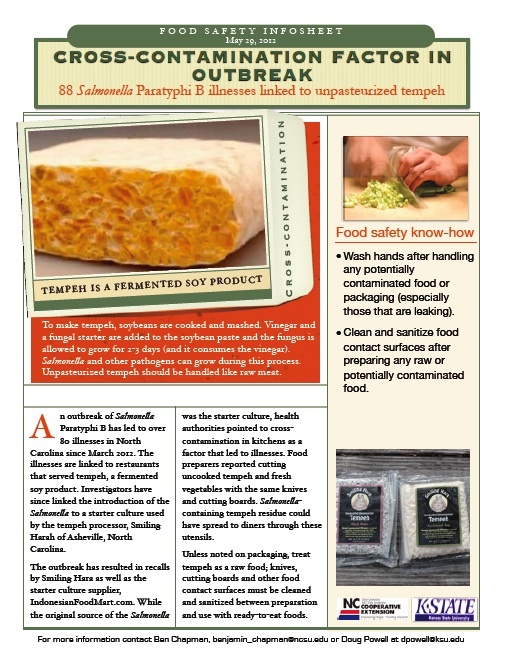 Food safety infosheets are created weekly and are posted in restaurants, retail stores, on farms and used in training throughout the world.